Is a visit to Japan high on your bucket list? Did you know that Australians don’t need a visa and the flight time is just over 10 hours from Sydney to Tokyo? Once upon a time the language barrier deterred some travellers from exploring all Japan has to offer. Not any more. Read on to find out why it is easier than ever for travellers to treat themselves to all that Japan has to offer. English has been a compulsory subject for all Japanese school students since 2011. It is true that English isn’t widely spoken in Japan, but the times are changing. Many young people, particularly those in the major cities, can understand English. It is very common for Japanese people to be able to read, write and understand more English than they can speak. Don’t let the language barrier prevent you from visiting Japan. Visitors to Japan are often pleasantly surprised by the locals who are known for their willingness to assist confused tourists. Japanese society places great value on respect and co-operation; people are generally polite and reserved. The culture of care for families, friends and acquaintances extends to welcoming all visitors with warm hospitality. Most locals will go out of their way to ensure your visit is enjoyable. If you become lost, don’t be afraid to ask for help. A slight bow, or a gentle handshake, is the traditional way to greet someone. Older people should always be greeted, and treated, with great respect. The friendly exchange you share will only serve to enhance your travel experience. The crime rate in Japan is very low. If you lose something it is highly likely that it will be returned to you, intact. I know of one traveller who left her laptop on a bullet train. The next day the laptop arrived, bubble wrapped, at the owner’s hotel! Such acts of thoughtfulness are very common in Japanese society. Most roads signs in Japan are expressed as universally understandable symbols. For example, ‘stop’ is a red triangle and a ‘parking zone’ is denoted by a blue P. It might be helpful to familiarise yourself with these basic symbols before your visit. 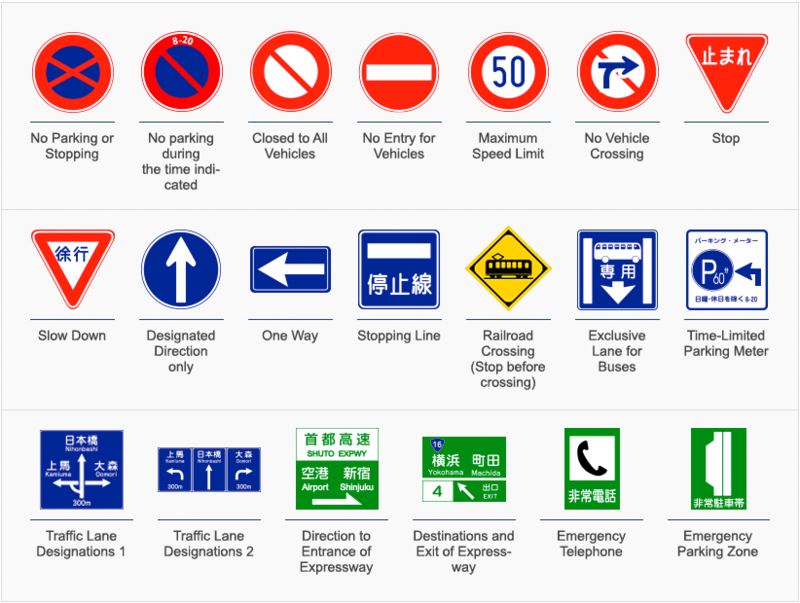 You can find images of some common Japanese road signs by clicking here. All directional signage on highways and major roads is presented in English and Japanese. If you plan to hire a car you might like to request a bilingual car navigation system for extra confidence on the road. If you do end up in a communication tangle, you might like to try consulting a translator app. Most of these resources work off-line so you will always be able to communicate, even without a Wi-Fi connection! It is a good idea to experiment with a couple of translator apps before you travel. You will soon get a sense of which digital translator works best for you. Most are free to download and some offer in-app purchases of further information, if required. The Bravolol Japanese English Dictionary includes customisable fonts for easy readability. The Japanese Translator by Xung Le includes more than 200,000 words, sentences and expressions. The Waygo Translator allows you to hover your phone’s camera over foreign text for immediate translation. The iTranslate Voice app uses voice-to-voice technology to translate your conversation, as you speak. The cost of travelling to Japan is not as prohibitive as it used to be. The expense of a visit to Japan is now comparable with a trip to Western Europe. So, if you’ve been dreaming of cherry blossom trees, temples and tea ceremonies now might just be the right time to go. Have you been to Japan? Do you have any language tips for travellers?